Ambient Digital is Southeast Asia’s another Ad Network. It was founded in 2010 and its headquartered is in Ho Chi Minh City, Vietnam. It is also the leading Ad Network in Vietnam and has reached out to its neighboring countries such as Singapore ,Thailand, etc. 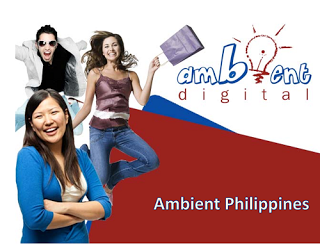 Finally, Ambient Digital is now in the Philippines. Filipino bloggers can now be a publisher. The thing is until now there is no dedicated website for applying that's why I searched ways on how to do this. Before desiring to apply, you should read the requirements below. Ambient Digital compare to others is strict in terms of laws but their ads formats are unique from all of other ad-networks and that gives a good point to this adnetwork. If you are a Filipino, you might be excited with this program. Bear in mind that you should learn proper guidance in decision making especially if you are making use of adnetworks. With Ambient Digital, your income is sure and they really pay. This is the reason why it is good to have this program. Now that you are knowledgeable with this program, I advise you to do the next step now. But first, read and learn below. * Publisher needs to have least 2,000 visits per day, more visitors is a Plus(based on Google Analytics). * Publisher should have good and frequently updated contents. * Publisher must not violate any regulation of content publishing regulated by the Philippine laws. *Willing to wait for the process and Meet Up with the Publishers managers in most cases for faster processing of application. *TIN number is required upon signing contract with them, make sure you have it. TIP: Email the 2 Publisher Manger listed above to make sure you will be recognized. sir pahelp nman poh..ndi co poh maverify ung website co s ambient pnu poh b un..? contact mo po via mail yung manager ng ambient na nakalist sa taas para assist nila po kayo. Mag rereply sila usually within a week kung okay ang site mo, pero pag walang reply possible denied ang application mo, but you may re-email then anytime for follow-up. Oks kaka-email ko pa lang naman kahapon. May nakita kasi akong tagalog blog na may ambient. Sana pansinin blog ko, nasa 172k view na rin kahit paano yun.